Peter* meets us in front of the city’s public health clinic on Clarence Street. Sarah Archer, one of two nurses on duty tonight, slides open the side door of the van that serves as their medical centre and invites the big, bearded 26-year-old inside. Archer is one of those people who has a knack for sounding as if she empathizes with everything you say. The tall, athletic 32-year-old digs inside one of the van’s cupboards to get the box. “What are you injecting?” she asks. Also in the van is Kira Mandryk, a petite 31-year-old public health nurse with a lip ring who has been working with Archer for about six years. She creates a client ID for Peter, using his gender, the first two letters of his mother’s first name, the first letter of his name, the month he was born, the year he was born, and the substance he’s using. That business attended to, the man wishes the nurses good night and leaves, a box of 100 needles and tips under his arm. No cookers, tourniquets, filters, or sterile water. He said he had the alcohol swabs. Ottawa’s needle-exchange program began in 1991, six years before the province mandated that every city offer clean needles to injection drug users. 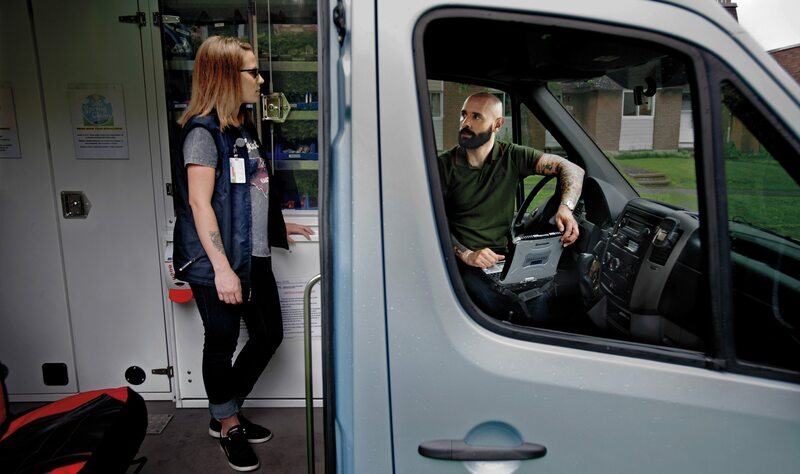 The van is part of the Site Clean Needle Syringe Program, which includes the Clarence Steet walk-in office, a sexual-health clinic, and other outreach programs. The goal of it all is to prevent the spread of infection among users. According to a 2012 report by University of Toronto and St. Michael’s Hospital, 10 percent of injection drug users in Ottawa have HIV infections, one of the highest in Ontario. In addition, 2012 data from Ottawa Public Health show that Ottawa has one of the highest rates of hepatitis C infection among injection drug users, at 70 percent. “Ottawa has had, since the mid-2000s if not before, a health crisis related to hep C and HIV among people who use drugs,” says Lisa Wright, a PhD candidate at Carleton University’s department of law and legal studies. Wright, who is studying how policies and regulation affect marginalized people, says Ottawa is an interesting case. The Public Health Agency of Canada reports that the majority of new hepatitis C cases are caused by sharing needles or other drug paraphernalia, such as crack pipes. Yet despite evidence that clean stems for crack pipes can lower rates of hepatitis, the city stopped offering safe inhalation services in 2007. The night I rode with the van, three people asked for “stems” and were given the phone number for the van run by the Somerset West Community Health Centre’s NESI program (Needle Exchange and Safer Inhalation), which is a similar needle program but includes pipes. The evidence is overwhelming that harm-reduction strategies work, yet the programs face opposition at every level of government. “Ottawa is known as a crack town,” Wright says, “so why doesn’t Ottawa Public Health have glass stems available?” The answer is politics. In 2007, Ottawa Public Health was giving out crack stems as part of its overall harm-reduction policy. But after a short pilot study, city council abolished the safe-inhalation program, along with funding for a study on how to manage cocaine withdrawal. This went against the recommendations of the city’s Community and Protective Services Committee. Wright says the ultimate harm-reduction strategy is decriminalization, with drug use treated as a health issue and not a crime. In the short term, a safe-injection facility similar to Vancouver’s Insite would help curb the spread of HIV and hepatitis C, not to mention the 40-some people who overdose every year. I meet Archer and her colleague Mandryk around five o’clock at a city vehicle depot at the south end of Clyde Road. 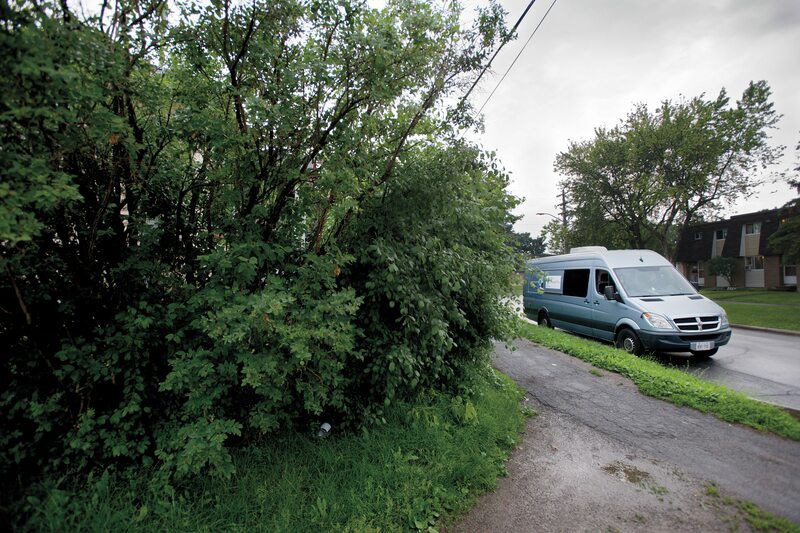 Their grey 2009 Dodge Sprinter looks like any other City of Ottawa vehicle from the outside. Inside, it has been fitted with a fridge, two countertops, cupboards, a chair near the back for taking blood, and another chair behind the front passenger seat for clients to sit in while waiting for their needles and equipment. The service offers everything a client would get at the Clarence Street clinic, but on demand. By the time I arrive, Archer and Mandryk have already had their first call: Alison*, a middle-aged woman who injects and smokes crack. Clients can call to ask for the van to meet them anywhere within city limits, seven nights a week between 5 and 11:30 p.m. If they request a full STI (sexually transmitted infection) testing, their blood is taken in the van and they’re given a plastic cup for urine, which they take into the closest washroom to fill. 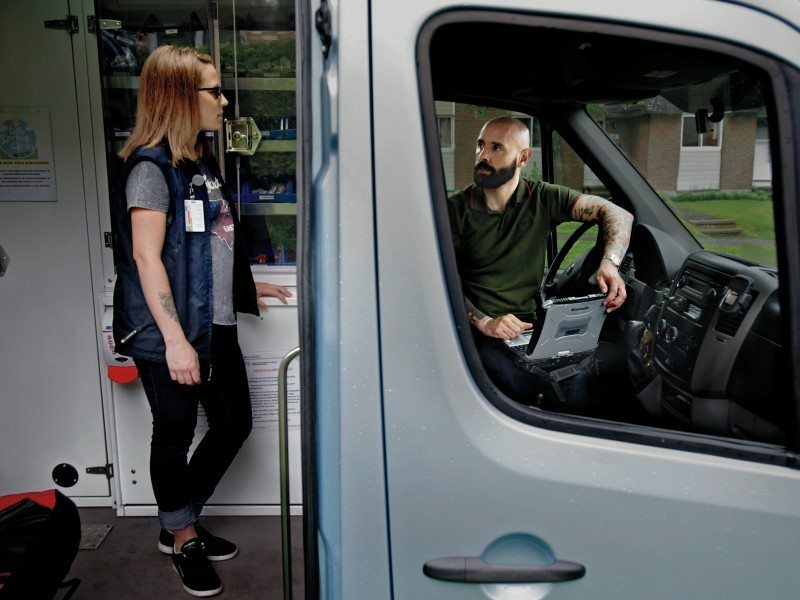 The van, which sees about 3,000 interactions and dispenses about 300,000 needles a year, is a bridge between two worlds. Many of the people who use its services inhabit the fringes of society and are wary of authority figures. The nurses are sometimes their only chance to speak with a health-care worker — or any person, for that matter. To maintain trust, core principles include anonymity and meetings free from judgment. As the first journalist to go for a ride-along, we agreed beforehand that I wasn’t to be undercover; every time clients call, they are given the option to have me dropped off before they enter the van. The meeting with Alison begins at 5:20 p.m. and takes about 30 minutes. She declines to have me present, so I wait at a Tim Hortons on Merivale Road. Archer and Mandryk keep her story brief: Alison tested positive for hepatitis C antibodies a few years ago and wants a full battery of STI tests so that she can be admitted to the hepatitis clinic at Ottawa General Hospital. Soon after I’m picked up, the phone rings. Brian* hurries across the parking lot. He’s 30, average height, wearing a blue sweatshirt, jeans, and a day’s worth of stubble. Brian is one of about 5,000 injection drug users in the city, one of about 1,000 the van will serve this year (given the anonymity of the filing system and that some clients forget or change their IDs, concrete statistics are not available). “Can I have two one-cc syringes, please?” He’s polite but nervous. He says he has been injecting cocaine for 10 years and doesn’t smoke crack. I don’t know what I was expecting, but I wouldn’t be scared of this guy in a dark alley. As soon as he has finished giving his client information, he exits with a soft “Thank you.” The whole interaction lasts about two minutes. “That guy looked like he could be one of my friends,” I offer. “That guy was pretty typical,” says Archer. Two clients and 90 minutes later, it’s now dark and we’re in Kanata at a Subway for takeout. The long drive to the next client in Vanier gives us a chance to talk. That night, the interactions I witnessed in the van were so positive that it is difficult to connect the van, with its earnest nurses and social workers, with the ideological (or purely fiscal) stance of those who oppose it. I asked Mandryk, when we first met a week before the ride-along, if Ottawa Public Health had any plans for a safe-injection facility. She said they see the value in it and would welcome the opportunity to work with anyone putting forward a proposal but that it’s only a part of a harm-reduction system. It’s a political answer. Mayor Jim Watson and police Chief Charles Bordeleau have said they are not in favour of a safe-injection site — and Ottawa Public Health is, after all, a city department. In any case, it’s worth noting that when the federal government passed Bill C-2, the Respect for Communities Act, in March, they effectively rendered the conversation moot. Insite, North America’s only safe-injection site, was born in 2003 when the federal health minister made a temporary exemption to the Controlled Drugs and Substances Act. In 2008, Insite applied for an extension before its temporary exemption ran out; they were denied and took their case to the British Columbia Supreme Court. In 2011, the Supreme Court of Canada found that safe-injection sites have been proven to save lives and that not providing drug users with a safe place to inject was in violation of the drug users’ constitutional rights. Addiction is considered a disability under Canadian law, so closing Insite was found to be discriminatory under Section 7 of the Charter of Rights and Freedoms. Legal experts and community-health advocates say that the requirements of Bill C-2 for opening a safe-injection site, including a letter of support from the local police chief and broad community consultation, have made it essentially impossible for a community to open another safe-injection site. But until that challenge wends its way through the court system, Insite will likely remain the only safe-injection site in North America. Scott is my only guaranteed interview for the night: Ottawa Public Health arranged for him, a regular Monday-night client, to speak to me. Other than a bout of serious alcoholism in his late teens (which ended when he was caught shoplifting Aqua Velva aftershave to drink), Scott had been sober until about the age of 50. He has thin chin-length grey hair, a short grey beard, and smudged glasses. In grey jeans and a jean jacket, he looks like an aging hipster. Scott has diabetes that he says gives him severe pain on the backs of his legs; it also gets him a morphine prescription of 168 pills a month. He injects it all or gives it away to other users. Scott takes off a shoe and sock to show me the gangrene that’s starting in his big toe. It looks badly bruised. Scott wishes us a good night and limps away with a box of 500 needles and other supplies for him and his partner. On the way to the next client, the van is silent — apart from the rattling shelves — for the first time in hours. I spent only 20 minutes with Scott, but I was struck by his fragility. At the start of the night, Archer and Mandryk had explained that they became interested in community health and helping those people on the fringes of society while working in hospitals. I ask Archer, who has logged the most van hours of any of the nurses, how the work has affected her. Next we meet Steven*, a well-dressed 24-year-old. He returns exactly 300 needles in biohazard boxes that staff give out with needles. The nurses gently ask about his health, what he is injecting, if he knows how to use the needles safely. Cocaine now, he says; he has been injecting cocaine and opiates since he was 14. “Can I say something about the van?” he asks me. “It’s important. It gives people a chance, a way to get better. Otherwise, without a place to get needles and drop them off, you end up with HIV or hepatitis C.” We say good night, and he wanders off down a dark suburban street near the Lincoln Fields mall off Carling. We’re on our way back to the depot on Clyde, where the inside of the van will be cleaned with disinfectant. As Archer and Mandryk head home to unwind before the next day’s work, I think about the men and women I saw that night. Addiction is a disease. Ottawa’s addicts aren’t going to get better on their own. 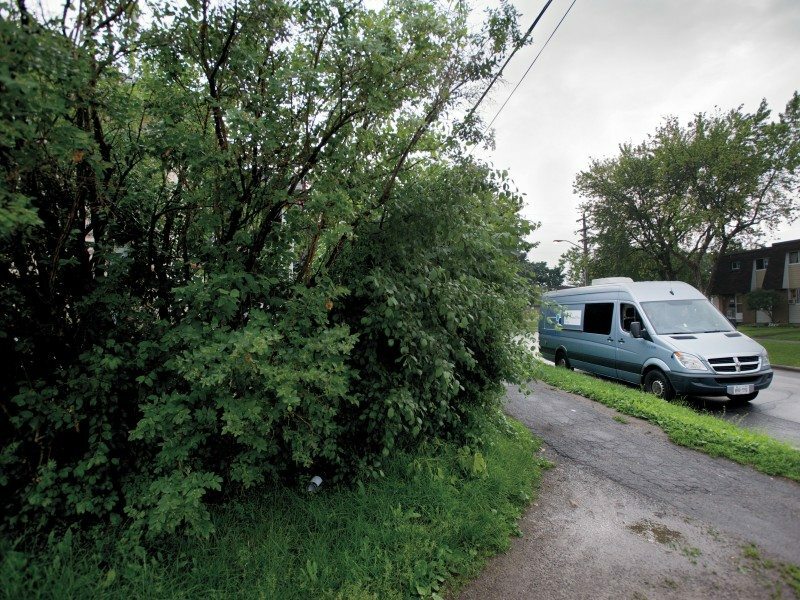 The city’s public health programs may not be a cure, but for a few minutes, the van offers addicts a chance, a place to be themselves — addiction and all — without shame. That’s a powerful first step.